As with all types of plant cultivation, genetics play a significant role in the overall quality of your crop. Traits like cannabinoid profile, terpene count and uniformity are highly prized among farmers. Sourcing seeds is an arduous process, as farmers are still required to plant seeds that have been approved for low-THC content. Complications with the federal authorities still exist, especially when seeds cross state lines. That’s why it is better to purchase industrial hemp seeds locally. As we saw above CBD is one of the most profitable compounds found in hemp plants. For industrial hemp to meet federal regulations, it needs to have a THC content of 0.3% on a dry weight basis. Currently, there is a lot of demand for high-CBD biomass and CBD extracts, as retailers are searching for ways to gain a competitive edge. According to reports, a crop that produces flowers with a 10% CBD content brings a profit of $25-35 per pound. A modest yield of a pound per plant could yield well over $60,000 per acre (assuming an acre has up to 2,500 plants). This is a serious earning potential for farmers and makes the sourcing of high-quality seeds essential. So, if you are looking to buy industrial hemp seeds with premium genetics, contact us today. We have a large stock of locally sourced high CBD hemp seeds for sale. What are feminized industrial hemp seeds? In theory, feminized industrial hemp seeds are specially bred to eliminate male chromosomes from the plant’s genome. Female hemp (and cannabis) plants are the ones that produce cannabinoid-rich flowers, as most of the resin is concentrated there. This sounds like great news to farmers who want to extract the maximum amount of CBD from their hemp plants. However, there is a catch: feminized hemp seeds are up to 10 times more expensive than regular seeds. What’s even worse is that there is no way of verifying the true genetic line of the seed until it’s very late. There have been incidents of irresponsible vendors selling overpriced regular seeds as feminized. Besides, even if a batch of seeds is feminized, it doesn’t eliminate the occurrence of males. What are regular industrial hemp seeds? Regular hemp seeds are the most common type of seed on the market. 50% of those seeds will turn out to be male, but at least their price is significantly lower. However, at the current state, buying feminized seeds from unknown sources is too much risk for an uncertain reward. That’s why regular feminized hemp seeds are the preferred way to go for most industrial hemp cultivators. Industrial Hemp Farms is one of the leading hemp seed wholesalers in the Colorado area, so don’t hesitate to contact us to inquire about buying wholesale seed. Hemp is a lucrative crop with a lot of potential for the grower. However, some things are useful to know before buying your industrial hemp seeds. Hemp cultivation requires a lot of lands to be profitable. You will need a hemp farm of at least 60 acres to start seeing some profit from your yield. It is tough to find seeds with good genetics. Due to the high demand, the market is flooded with inferior genetics, or even worse, snake-oil salespeople who push regular seeds as feminized ones. When you are out on the market to buy industrial hemp seeds, avoid brokers and go-betweens. There is a lot of red tape. Hemp is legal, but only if it has a low THC content. To avoid inter-state complications, is it preferable to buy hemp seeds locally. Processing is expensive. The equipment required for the extraction and processing of hemp is quite costly. Most growers have contacts with companies who do the processing for them. Here at IHF, we grow all of our hemp seeds ourselves and also provide extraction services. Learn more about it here. 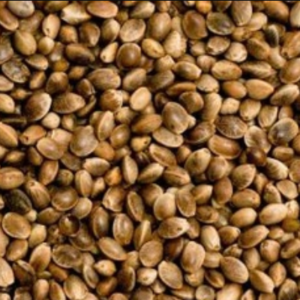 Here at Industrial Hemp Farms, we have an ample supply of wholesale regular and feminized hemp seeds. We also sell wholesale clones for those not wishing to grow from seed. If you are looking to buy bulk wholesale hemp seeds in the Colorado area, reach out to us. We are not brokers, and we produce each seed that we sell. Contact us to book a tour of our 300-acre facility and check the quality of our seeds yourself!